Note: Unfortunately, this establishment has closed down. My undergraduate college days in Memphis must have had quite an impression on me for it was in that Mid-South city that I was introduced to many new experiences at a youthful age of 17 years old (also see last blog on Mediterranean Kabob). One of them would take place quite regularly next to a dark parking lot behind a drive-in theater screen – yes, this was the early 80’s. That was the location of one of the few Vietnamese restaurants in the city which my brother, future sister-in-law, and I would pay numerous visits in order to taste this Southeast Asian cuisine that shares similar notes with the foods we grew up on. This was also the era in which Thai restaurants were not in vogue yet, which may seem unimaginable these days. In this little dive, I was introduced to its traditional dishes and to the exquisiteness of Vietnamese cuisine. A visit there was always a soul-satisfying cheap eat, especially for us money-strapped students. When I arrived in the DC area for my graduate school in music, there were a plethora of Vietnamese eateries in the metro area due to the high number of immigrants that established themselves in the metro area. Not far from the university that I was attending were a couple of Pho Beef Noodle shops that I frequented often, especially during the cold months. I had heard of a shopping plaza in Falls Church, VA where many good restaurants were located, and over the next few years, I would visit a couple of these restaurants and savored truly authentic and delectable dishes in which a mostly Vietnamese crowd was seen enjoying. However, a month ago, a few friends and I paid a visit to one of these eateries in Eden Center (or Little Saigon as I call it) and we had a quite disappointing experience. To make matters worse, one of our favorite joints had moved further out to the boonies, and the word on the street was that its kitchen’s cooking has been adapted to the non-Vietnamese clientele in their new locale. Another Vietnamese restaurant in the city closed down a couple of years ago which brought a collective moan among the dinner group. I had known about Green Papaya in the Bethesda Row area for a number of years, and the reviews that I had read had been quite glowing. However, Bethesda has been a bit of a culinary terra incognito for me, since it is located on the other side of the beltway and some members of my dinner group are, hmmm, geographically challenged, thus making a trip out there close to impossible. But one Friday, a friend and I were the only ones available, and with a coupon (yes, those dreaded things again, LOL) as an incentive, we headed out to the land of the unknown. We had a challenge paying for the parking since we did not have enough change, and we had to register our credit card on the phone in order to pay the meter. When we got to the restaurant, we were slightly frazzled by the parking hurdle, but stepping into the low-light ambience, we quickly settled into the extensive menu and the luxurious yet soothing environment. Perusing it, I recognized many traditional dishes along with modern renditions of recognizable flavors. Since it was my first visit, I decided to stick with the familiar. The meal started with a couple of traditional appetizers – Chai Tom Cuom. It is minced shrimp wrapped around fresh sugarcane strips as skewers and then grilled. The grilled shrimp paste was moist from a hint of coconut milk, smokey from the grilling, and delicate from its light seasoning. 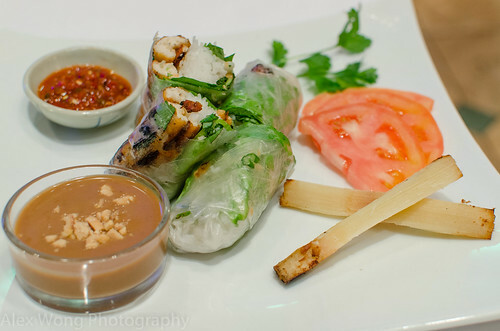 It was stuffed inside a rice wrapper along with rice vermicelli and fresh lettuce, with a delicate peanut sauce and chili sauce on the side for extra flavoring. This was one of the best fresh wraps that I have tasted, and I was constantly marvelling about the delicateness of the different textures and flavors. Chewing on the sugarcane skewers was a great accompaniment and flavor partner to the rolls which were made rather mild by the grilling. After devouring this appetizer, I knew that there were more good things to come. The other opener was a dish that I have eaten in many places – Green Papaya Salad. 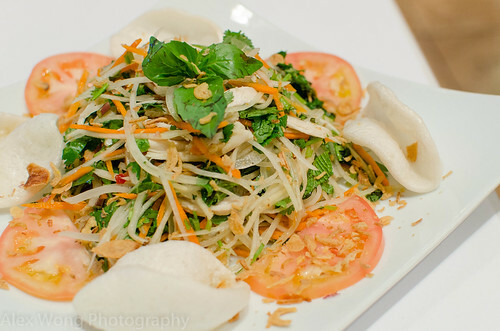 Thin julienned strips of green papaya are joined by strips of chicken, fragrant basil and mint leaves, crunchy fried shallot rings, all married together by a cocktail of fish sauce, lime juice, and sugar. Pieces of delicate fish crackers surround the mound and they provide the crispy platform to serve and eat the salad. This was truly refreshing and flavorful, whose success is mainly attributed to the well-balanced and delicate salad sauce – there are no single element that is vying for attention in this concoction. Here, we see the kitchen’s masterful hand and the establishment’s use of high quality in its ingredients, especially in the fish sauce that I was straight-sipping like fine whiskey. I could not get enough of this dish but I had to make sure I had room for the rest of the meal. Banh Xeo has always been a favorite of mine since the Memphis days. 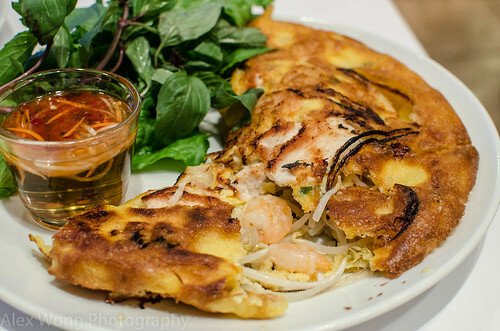 It is basically a stuffed pancake, a vestige from Vietnam’s French colonial days. This restaurant’s version had the customary crispy golden exterior, a moist interior, and a filling of shrimp, chicken, onion and bean sprouts. What makes this rendition stand out is the batter that has been enriched by coconut milk and the soufflé-like interior which was a contrast to the crunchy top. Flavor enhancers on the side were fragrant basil leaves and a heavenly elixir made with high-quality fish sauce that provided the necessary saltiness to the slightly bland pancake – this pairing is obligatory, hence the deliberately underseasoned batter. Large pieces of lettuce leaves provided the crispy and cooling element to this wonderful dish. A familiar dish served in many Vietnamese restaurants is a Caramelized dish, and in my case, made with chicken (Ga Kho Ghung). 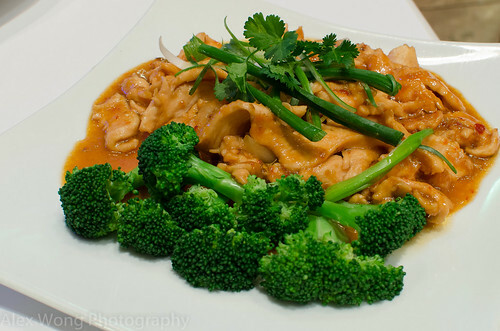 Its sauce is made with some caramelized sugar that tempers the pungent and salty fish sauce. This restaurant’s version had the right proportion of the slightly sweet and the brininess, made successful in large part due to its high-quality fish sauce. The pieces of chicken were very moist and tender and this dish kept begging for more of my attention. I must admit that this has been probably the best caramelized dish I have ever tasted. 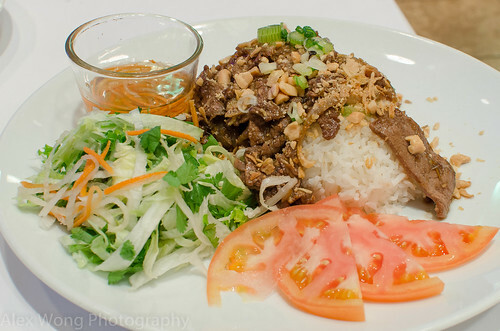 My dining companion’s choice was a perennial selection, Lemongrass Beef – Bun Bo Nuong. It is usually served with cold vermicelli noodles but upon request, it came with some hot steaming rice. Wow! The beef was so tender, an indication of the high-quality meat, and it was packed with the lemongrass flavor with a hint of the grill smokiness. A topping consisting of fried green onions, toasted peanuts, and crispy fried shallots added more flavor and texture to the dish. I guess I should not have complained about my friend’s order this time, judging by my effusive remarks. Unequivocally, this is the best Vietnamese food that I have eaten in the metro area. The whole dining experience was indeed pleasant and warm, from the lush beautiful ambience to the efficient amiable service. But the true star is the kitchen’s expert hand in producing the best dishes that I have ever savored of this Southeast Asian cuisine . I cannot wait to pay it another visit to try the owner’s recommendations of the Caramelized Chilean Sea Bass and Lemongrass Rack of Lamb. Green Papaya is most definitely a restaurant worth paying a visit and dealing with the parking issues – perhaps my next visit will be on the weekend, when parking is free. Thanks. I hope you keep on feasting on my blog site since I can’t have you over for dinner, buddy! Much love.